Navratna title is given to most successful nine Public Sector Enterprises (PSEs) of India in the year 1997. Now the number of Navratna companies rose to 19. Bharat Electronics Limited : BEL is one of the electronics companies in India and it got the status of Navartna from the Government of India. As of April 1, 2008, BEL's order book is estimated to be around Rs.9,450 crores. Bharat Heavy Electricals Limited : BHEL is largest engineering and manufacturing enterprise in India. Its products are power generation, industries, transportation, renewable energy, oil and gas and transmission. This PSU has good track record for last fifty years. Bharat Petroleum Corporation Limited : BPCL is one of largest oil and gas company in India bearing the status of Navratna. It is one of finest oil companies in India, in the arena of petroleum industry. Coal India Limited : CIL is the world's largest coal miner and best PSU owned by the Government of India. The headquarter of the CIL is in Kolkata, India. Its a coal mining and production industry. GAIL (India) Limited : GAIL was known as Gas Authority of India Ltd. Its one of largest gas transportation PSU of India. Hindustan Aeronautics Limited :HAL is one of Asia's largest aerospace companies and pride of India in the arena of aerospace and defense. Hindustan Petroleum Corporation Limited : HPCL is one of giant oil companies in India. HPCL got the Navratna awards from the government of India. It's also a globally recognized company of India. Indian Oil Corporation Limited : Indian Oil is a PSU of the government of India having the Navratna status. It's major products are petrol, diesel, kerosene, LPG and petrochemicals. National Aluminium Company Limited : NALCO is the Aluminium manufacturing industry of India. It's is recognized globally for its latest and finest technology in Aluminium manufacturing and also largest industry in aluminium complex and encompassing bauxite mining. National Mineral Development Corporation Limited : NMDC Limited is the largest iron ore producer in India. This is government owned PSU,that also got the status of Navratna. Oil India Limited: Oil India (OIL) is the pioneer in exploration and production of hydrocarbons in India, and traces its roots back to Oil India Private Ltd.
Power Finance Corporation Limited : Its a major financial PSU in power sector in India. It's advances the loans like - rupee term loan, foreign currency loan and short term loan. Power Grid Corporation of India Limited (PGCIL) : PGCI is the largest transmission utilities in India and is a Navrantna Public sector Enterprise. Rural Electrification Corporation Limited : The major task of this Navratna Public Sector Undertaking is to finances and promotes electrification projects in rural parts of India. Shipping Corporation of India (SCI) : SCI was incorporated in the year 1961. It operates and manages vessels that services both national and international lines. 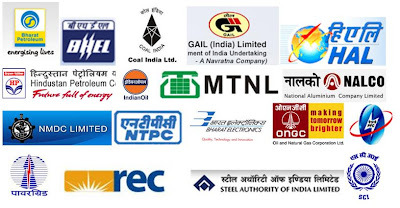 Steel Authority of India Limited (SAIL) : SAIL is one of the highest profit making PSUs in India. It was founded in 1954. With the annual production of 13.5 million metric tons, SAIL is the 16th largest steel producer in the world. National Thermal Power Corporation : NTPC Limited is one of largest power generation company in India. Oil and Natural Gas Corporation Limited (ONGC) : ONGC was incorporated in 1993, with in span of few years it become Asia's largest and most active companies involved in exploration and production of oil. It's very usefull for me so thanx. how am i apply for Bharat Petroleum cooperation limited, i am persuing BE. how am i apply for bharat petroleum cooperation limited, These days i am persuing BE.